Oh to have a leader like this again. I know we cannot have another Ronaldus Maximus Reaganus but, it was good for America then and it will be good for America again. Thanks Matt for the links!! On June 12, 1987, President Ronald Reagan declared, “Mr. Gorbachev, tear down this wall!” It was our generation’s equivalent to “Remember the Alamo!” This month we celebrate the 20th anniversary of this wonderful declaration for the cause of freedom on behalf of repressed people in Central and Eastern Europe. We should renew our shared commitment with our allies in Europe because it is the transatlantic relationship that is America’s anchor for global engagement. Although Ronald Reagan’s words must have seemed like only a dream, they resonated in the hearts of East Berliners who led restricted, hopeless lives. The dream of freedom did come true because of the steadfast, essential political and logistical support of Prime Minister Margaret Thatcher and Chancellor Helmut Kohl. The moral compass was provided by the respected Pope John Paul II. And Lech Walesa, behind the Iron Curtain in Poland, had freedom lovers all over the world in solidarity with their cause. Bring Back The Reagan Years! Success in politics depends on the ability of a candidate or a party to forge and maintain coalitions. 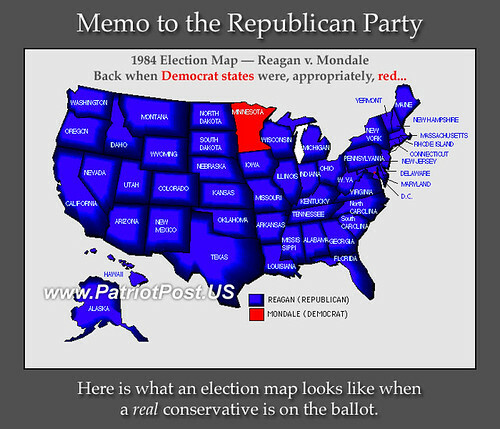 One of the most successful coalitions in modern political history has been the “Reagan Coalition”, which brought together economic and social conservatives under the umbrella of the Republican Party. Preserving that coalition brought the Republicans great success, including occupancy of the White House and twelve years of control over the House of Representatives. The coalition that Reagan fashioned is fraying, however, and is on the verge of unraveling. The causes are many, but the coup de grace is likely to be the current controversy over immigration. At first blush, the union of economic and social conservatives seems an odd one. The most influential among the economic conservatives are the “blue bloods”. They are fiscally conservative, but often socially liberal. They enjoy the trappings of money and power and see politics as a means of increasing both. Consequently, they invest in political campaigns as a “cost of doing business”, expecting that if they ride the right horse across the finish line, they will get a “return on investment” which usually comes in the form of tax breaks, financial subsidies, or limited accountability for their misconduct. Cash is the currency of the rich and powerful, and they do not hesitate to invest it in political campaigns. Financial concerns are at the top of their list. The following is a transcript from the Bennett Morning’s radio show this morning. Go there and read the rest. I can hardly wait for the Moonbat response(s).